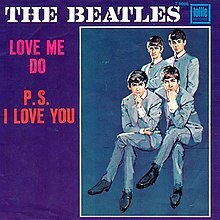 "Love Me Do" is the Beatles' first single, backed by "P.S. I Love You" and released on 5 October 1962. When the single was originally released in the United Kingdom, it peaked at number seventeen; in 1982 it was re-promoted (not re-issued, retaining the same catalogue number) and reached number four. In the United States the single was a number one hit in 1964. In 2012, the song became Public Domain in Europe. There are currently law proposals to extend the copyright another 20 years.